So, I picked up the Revlon Color Burst l/g in rose pearl, which is recommended by Emily Eddington, along with some CVS brand makeup remover pads & some more lash adhesive. From the e.l.f. website I got a mineral lipstick in runway pink, 2 glossy lipshines in Goddess (a golden pink) & Angel (cloudy, transparent shade with lots of shimmer & some sparkle), & a pair of the natural lashes. The 32 palettes were on sale, so I also got the neutral palette. 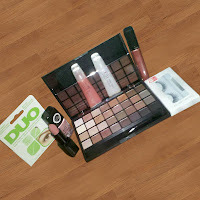 To get a better view of these products & see some swatches, check out the video below.